It couldn't happen, surely? Not again? Well, it did. Another Grand Prix weekend, another Grand Prix weekend wherein something or other has compromised Lewis Hamilton. And while one or two of the ones before can be said to have been his own fault, most of them haven't. 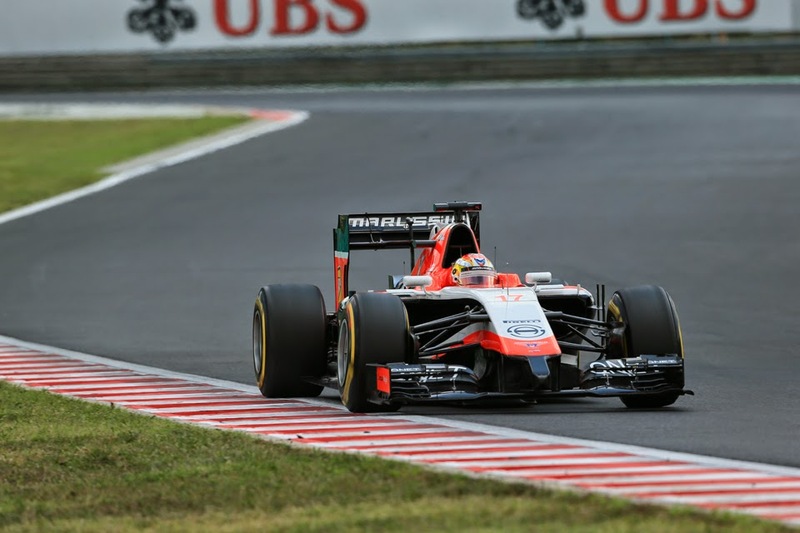 And it wasn't yesterday in the Hungaroring's qualifying session either. Almost unbelievably no sooner had the hour started as Lewis - who'd been fastest in every session up until then - could be seen tooling down the pit lane, his W05 ablaze as a result of a fuel leak, his session over almost before it had begun. The gasp around the circuit almost was audible, followed by something of a silence consistent with people not quite comprehending just what it was they were witnessing. Now, Lewis's last qualifying and race weekend not containing major problems or unusual occurrences was all the way back in Barcelona, in early May. Six rounds ago in other words. And for all that F1 is a precise game wherein everything and more is sought to be accounted for and controlled, it remains - perhaps increasingly - that the most credible explanation for it all is that he must have done something to grossly offend the Goddess Fortune. It consigned Lewis to P21 in qualifying, and just like last week in Hockenheim's qualifying it had a subsequent tremor: this time he’ll have to start the race from the pit lane due to the subsequent damage. Just like last week too it gave his team mate Rosberg an open goal, but unlike last week he had the odd stumble in his run up to take his kick. The elements - unusually for Hungary - had something of a say as rain came down at the start of Q3. All sought to set a time on slicks early, but the track was at its wettest at turn one, and Nico went straight on and explored the run off area. He admitted afterwards that he'd thought he'd blown it, as had more rain arrived that would have been his best chance at setting a time gone. But Fortune once again was kind to Nico. Kevin Magnussen had a big accident at the same corner, the red flag emerged and then the rain went away. By the time all ran again the circuit was close to dry. Sure enough Nico pounded around to claim pole by half a second. Normality was restored in more ways than one. Nico had the grace afterwards to recgonise that the same Goddess Fortune is rather smiling on him right now. 'Well, it (Lewis's problems) makes it easier of course, because he's my competitor number one' said Nico. As you might imagine this particular fire on Lewis's W05 ignited yet more social media talk of conspiracies. German team favouring German driver and all that. Hamilton possibly stoked the fire too with words that could be interpreted as loaded: 'It’s getting to the point where it's beyond bad luck now, as a team, we need to do better.' That though could have been a reference to Mercedes reliability generally, which all in the Brackley team admit is not nearly good enough. So the stoking could have been unintentional. The frustration of Lewis Hamilton fans is understandable of course, most pointedly as the Lewis/Nico score in debilitating stoppages in 2014 reads 4-1 in Lewis's favour (or, should that be, to his expense). 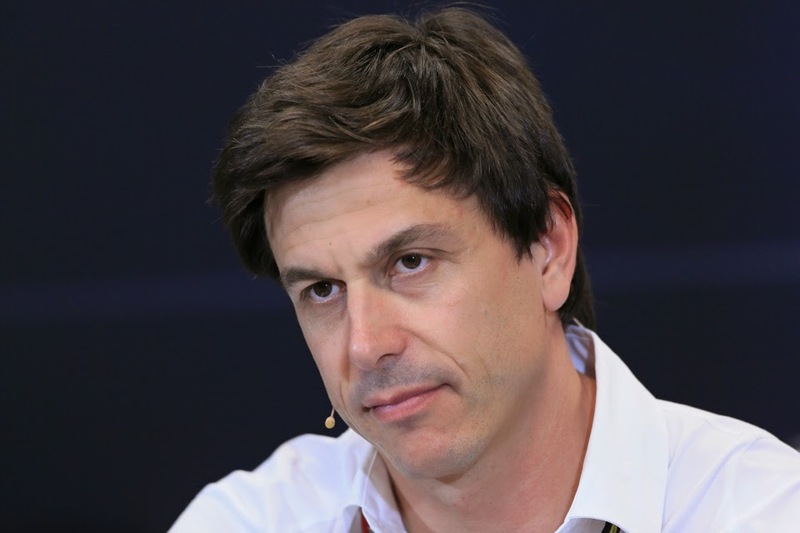 Yet if I'm any sort of reader of body language Mercedes boss Toto Wolff after qualifying was taking no pleasure at all in Lewis's woes. On the conspiracy talk he sought to pour oil on troubled waters. 'These are his fans and we have to understand that they are extremely upset about him losing out to Nico because of a reliability issue' said Wolff, 'in the same way that we are upset for him as we want this championship to go until the last race, we want the two cars to fight it out on track, and not have a championship influenced by reliability issues. 'We must solve the reliability problems…It is not something we will accept. We will tackle it very hard in order to get on top of these problems'. Nico too acknowledged too that things have been going for him recently, as well as that there is something of ‘there but for the grace of God’ about his serene progress right now. My view for what it's worth is that yes the Mercedes reliability isn't good enough. And the only credible explanation for it disproportionately hitting Lewis is nothing beyond that mysterious yet ubiquitous factor called random chance. In this case, blind wretched random chance. After all, while it's common to hear claims that such matters necessarily have to level themselves out over a year it's also fallacious. There is absolutely no reason that it has to – unrelated events cannot be related. Indeed one academic study suggested that a football season would have to be seven years long to be sure that fortune would fall out evenly – and remember that football seasons are much longer than F1 seasons. As well as that the space of time we're talking about here is just over half of a single campaign. However hard that may be for Lewis and some of his fans who naturally are groping for explanations right now to accept, this all most likely reflects nothing more than just luck - of the utterly foul variety. As a footnote too it was also pointed out by one journalist in the Mercedes post-qualifying press conference that last year at Merc Nico in fact had a monopoly on breakdowns, experiencing three to Lewis's none (which ironically now makes the Lewis-Nico match-up four apiece). 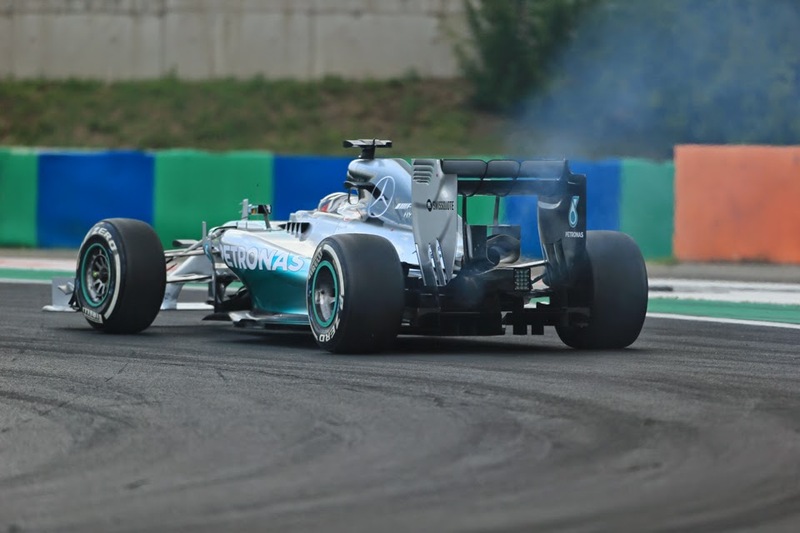 We know that Hamilton came through the field with some vigour in the Germany race a week ago, but doing it in Hungary will be another matter. Lewis himself in this vein reckoned a top five would be an achievement, though Wolff believed a podium is not out of the question for him. Still, it'll be fun watching him try and if anyone can pull off an overtake it's Lewis. Particularly Lewis with a rapid package beneath him. Behind the latest episode of the Merc soap opera it was a certain Sebastian Vettel that was best of the rest, lining up in P2 for the race start. 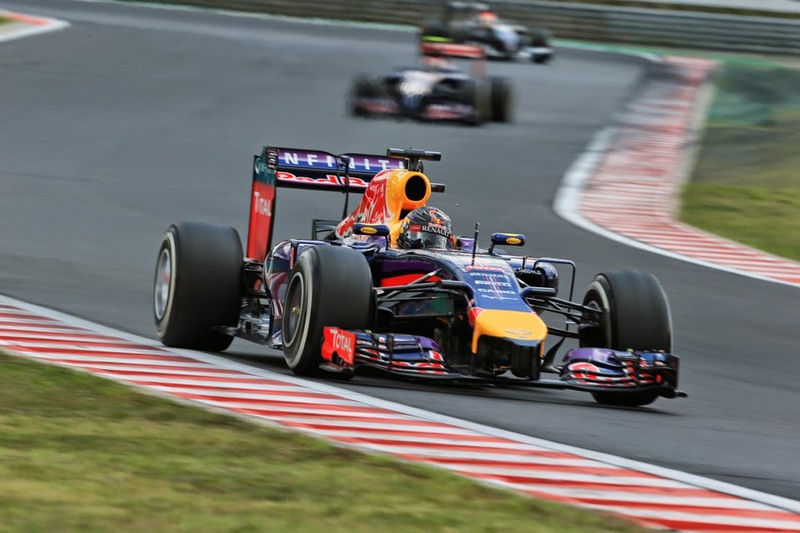 As expected the tight and sinewy Hungaroring suited the fine-handling, packed-with-downforce, but not great on the straights RB10. Vettel too demonstrated that the old verve and bravery of before still exists with stunning pace when the track was still greasy in Q3. For a time it looked like it might be enough to get him pole. 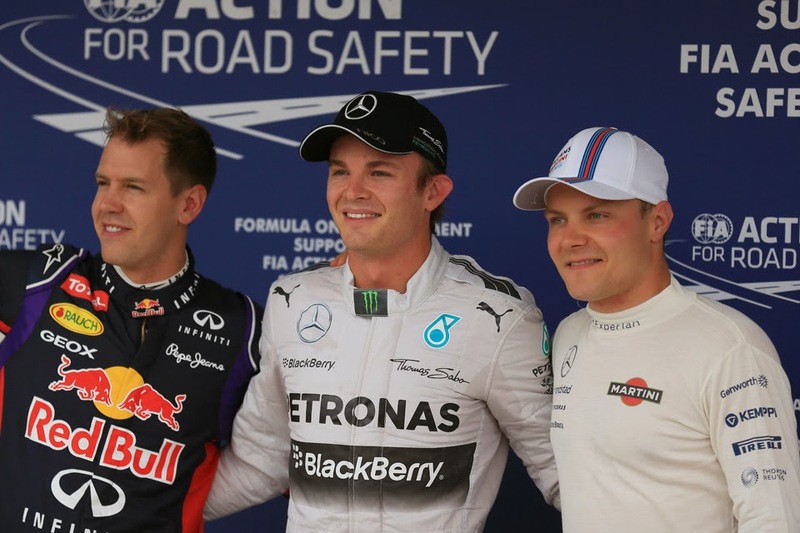 Even in a dry race Seb doesn't think a challenge to Rosberg is out of the question. His team mate Daniel Ricicardo hasn't quite looked on Seb's pace at any point this weekend and lines up directly behind in P4. Between them once again in Valtteri Bottas, who admitted to surprise at being so high up on a track that wasn't supposed to suit the Williams. Ricciardo meanwhile noted that where the fast-in-a-straightline Grove machine ends up after the start will likely go a long way to framing either Bull's afternoon. Next up as always it seems in fifth is Fernando Alonso, but it was elsewhere down Scuderia way that we had yet more drama in a dramatic qualifying hour. In the other red car Kimi Raikkonen was bundled out in Q1, after the team calculated, as pretty much everyone did, that with Lewis as well as Pastor Maldonado out and with the remaining four drop-out places in Q1 likely to be filled by the Caterhams and Marussias there was no point doing a Q1 run on soft tyres. But they didn't count on a stunning lap by Jules Bianchi, one that he subsequently described as perfect, that sneaked him into P16 and into Q2 at Kimi's expense. Yes, that's the same Jules Bianchi that is a member of the Ferrari young drivers' programme, who impressed in a recent test and is touted on occasion to replace Kimi in a race seat at Maranello. Lord above, who writes this stuff? We can criticise Ferrari's approach with justification (and plenty did) but equally Kimi's time set was some seven tenths slower than Alonso's, who was on exactly the same strategy. In F1, being quick isn't half good at making other problems go away. It's not always the case for Mercedes though, for whom right now being quick is the least of their troubles.